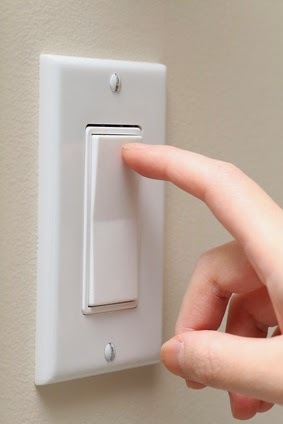 Is your Project Team like a Light Switch...or a Candle? A few years ago I went on a fly-fishing trip with a group of work colleagues. I was working on a project in New Zealand, and we were going to be staying in an old company-owned holiday "bach" just outside of Taupo. You could book these properties for a weekend and pay a small fee. A basic type of unit - furnished with several beds, kitchen, TV, tables, chairs and couple sofas - nothing too fancy. We unpacked our gear, loaded up the fridge and headed back outside for fly-fishing lessons. My first ever lesson - and apparently you need to learn how to do it while on dry land (without a hook) just to get used to the back-and-forth action before you try it standing hip-deep in a river. Perhaps to make sure you didn't fall over while casting - or hook anyone around you. After about an hour of practicing casting, it was getting dark and our arms were getting tired, so we headed back in to get dinner ready and settle in for the evening. One of the guys was frying up dinner while the rest of us chatted and watched the little black-and-white TV. I was just walking back into the living room with a fresh beer when the lights went out. "Who turned off the lights?" I asked. "There's some coins on top of the fridge," one of the locals called out from the sofa. "Coins on top of the fridge. Put some in the slot." He sighed and got up. "In the meter." He walked over to the fridge and picked up three coins. He popped them into a box on the wall, one by one. The lights suddenly came back on. "That should do for an hour. We pay for power when we use the bach - it's one reason it is so cheap to stay here." I studied the pile of coins on top of the fridge. It was perhaps my first experience of "user pays" - in this case, quite literally with a pocket full of change. I was experiencing a sudden and strange shift in expectation - electricity is just supposed to be "on", right? When you stop to think about it, there are many things we take for granted in our every day lives. Turn on a switch, the lights come on, turn a tap and clean water comes pouring out. We get in our cars and turn the key - we expect it to start, and take us where we want to go without breaking down. (Assuming we do some basic maintenance, and fill the tank regularly). The fact is, there is a lot of investment into the systems, products and infrastructure to support all of these "easy-on" things we use in our every day lives. We seldom appreciate the effort that has gone into those systems - and are rarely thankful that we have them. We have got used to them just being there and working - that is simply the way it is supposed to be, right? We complain when things stop functioning - but when is the last time you thanked a light switch for working? Well, probably never as that is a bit strange, perhaps - talking to inanimate objects. But have you ever called the electric company to say "thanks for keeping the power on yesterday, I had a big family dinner last night, and I was able to cook the roast until it was finished"? I am guessing also - never. You may think I am being ridiculous - but consider this: We have become quite accustomed to these comforts in our society. Not so many decades ago, the hours you were awake (let alone working) were limited by daylight - or how much candle wax you had left to spare. Back then, you would make a conscious decision to stay up and use an extra candle - or save it for another day and hit the hay when it got dark. Today, you just switch on the light and watch TV until late in the night, night after night, without a second thought. "All right, all right, you've made your point," you say. "But do I really have to call the power company in the morning to thank them?" Well, that is up to you - but it's not a bad idea. The problem is, they will probably treat you like a crank caller. Why? The answer is simple - nobody expects that level of courtesy any more. Besides, they wouldn't call the plumber to thank them that the toilet didn't back up yesterday, would they? They, like you - simply expect things to work. It is just another symptom of what you might call the "Light Switch" Society. How do you switch this thing on? How do you treat your team members? I am guessing for many, that on any given day they are being treated exactly like a light switch. They show up for work in the morning, and -click- they are expected to be fully productive and on the job. Work a full day, then -click- at around 5pm or so, they pack up, and trudge off home through traffic to screaming kids and a nagging partner. And tomorrow, the same routine: -click- on, full work day, -click- off home. And although there are a lot of problems with that whole approach, which I will touch on next, a sometimes bigger problem is that the switch stays on - or is forced on - until much later in the day, past normal working hours. Email, laptop, smartphone, deadline pressures from work - all of these can easily steal our "home" time and deny us time to rest and recoup for the day ahead. There are many books and discussions on that particular topic (work/life balance) - but what I would like to focus on here is the "Light Switch" perspective of working with your project team. Of course, we are professionals, and should be committed to doing our best, do a good job, work a full day and be able to leave work "at the office" if we are lucky. The "Light Switch" problem is more about attitude - how we approach each other, and set expectations on one another. In a very real sense, we are imposing a new technological symbolism onto the workplace, with all of its implied behaviors - and adverse side-effects. Up through the 1800's, people had a physical appreciation of resource consumption and limitations - if you were up late, you "burned the midnight oil" (literally), and people who worked late and rose early needed light - so they "burned the candle at both ends" [of the day]. In fact, the phrase "burned out" likely grew from that time period and earlier - when physical and mental exhaustion had direct parallels in their environment - i.e. the simple candle. You could only burn it for so long until it ran out of wax. A similar thing happens with people - they run out of energy and need to rest. Light switches, however, behave quite differently. Q: When is your Project Team like a Light Switch? A: When you treat them like one. "Ha ha," you say - "but what does this mean for my projects?" Power source: invisible - no input or energy required from you, after flipping the switch. The light switch does not change. Light remains On or Off until changed, without visible energy requirements to remain so. Now, think about that - and your team for a moment. If you treat your team like a light switch, this means you are taking them for granted. They should simply work hard, without thanks or praise, and do it consistently day-in and day-out. No encouragement required, no mentoring, no guidance - and certainly no development training. Switch them on, work - off, go home. No consideration of what drives or motivates them, just work. In effect, they are viewed as just a machine. Not very nice, is it? And yet there are many bosses out there (I would not call a person like that a Manager) who do behave like that. I would not expect to see a top-performing team in this situation. More likely a group of people looking for the nearest exit, as soon as they can scramble to it. Care about your team. Great leaders actually care about their teams - as people. Ask their opinions about project matters - because they probably know more than you do. You have a skilled team precisely because you can't do it alone. Nurture your team - get to know them personally. Put some time and effort in and invest in those relationships. Get to know them! Encourage them, praise in public - deliver constructive criticism in private. Develop their skills. Projects are a great way to try something new that they may not get in a normal 9-to-5 job. Make the most of the opportunity. See what their needs are to help them grow and develop, and help them get any additional training they may need/want. Lead, Mentor and Coach them, not just direct or dictate task assignments to them. Engage with the team, one-on-one. Don't be afraid to get your hands dirty. Pitch in and help when it is needed, rather than supervising from on high. Remember, teams are made up of people - not switches, not numbers, and not role assignments. A company is nothing without its people - and the same applies to your projects. Looking back at that old pay meter in the holiday bach, I think it is a good symbol for bridging the old and the new; you get the advantages of steady, stable electric light - and no burned fingers working with candles. However, it also reminds us that you need to put some effort in on a regular basis - you need to engage in the process. Translated to teams, we need to step back from the modern-day perspective of looking at everything as if it were a machine (or cog in a machine). What makes the difference between a good and a bad workplace, or a good and a bad project, is how people interact, or fail to interact - with each other. Light switches are convenient - but you also need the personal interaction you get with a candle. Why not try it one weekend - while camping, or even at home? Tuck away and ignore those electric devices, and live up close and personal by candlelight. Heck, it might even make for a romantic evening. But what about the rest of the fishing trip, you ask? Well, it was a fun weekend, but the water was muddy from recent rains and nobody caught any fish. Although I did see direct evidence that I was, in fact, on the far side of the world, far away from home. While I was standing hip-deep in the river, casting back and forth, I noticed some small, odd objects floating down past me. They didn't look like wood. When one came within arm's reach, I plucked it out of the water to have a closer look. I turned it over in my hand, inspecting it closely. I was holding a rock - a floating rock. It was then I knew that I was truly on the bottom of the world, and up-side down - because how else could rocks float? Good luck with your projects, and keep an eye on those candles.